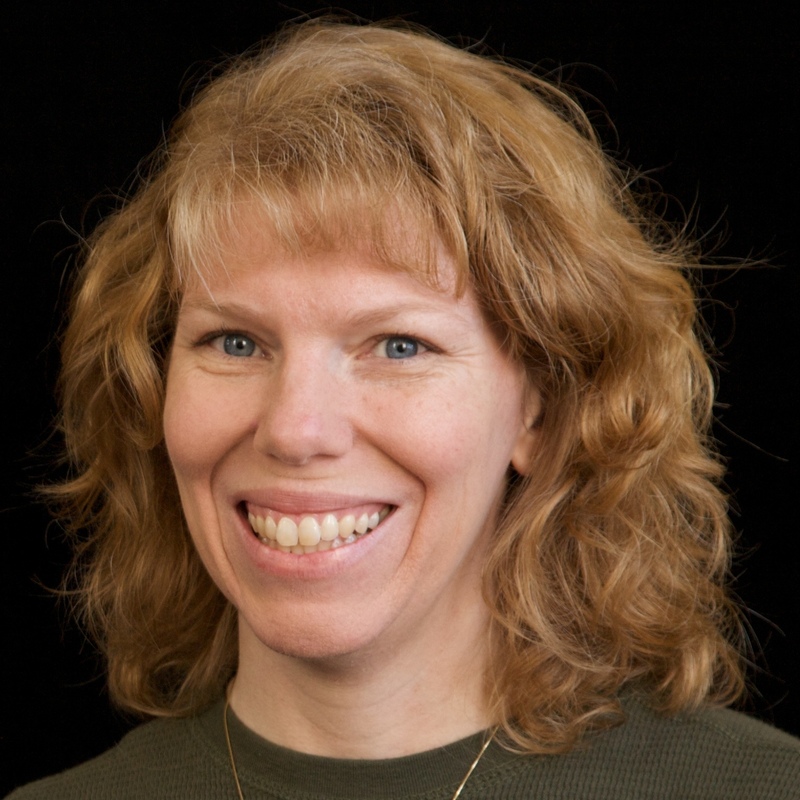 Cindy deRosier: My Creative Life: Taste the Red, White, & Blue! What a crazy few days we've had! I'm home from two busy days of judging at a county fair (more on that later) immediately following Trevor's party, and we've jumped right into swim lessons, doctor appointments, and a bunch of other stuff. I still need to go through all my photos to put together a post about the Star Wars party. In the meantime, here's a prewritten post about one of our county fair entries. When Trevor and I were looking through the county fair guidebooks planning our entries, a kids' poster contest at the Alameda County Fair caught our eye. 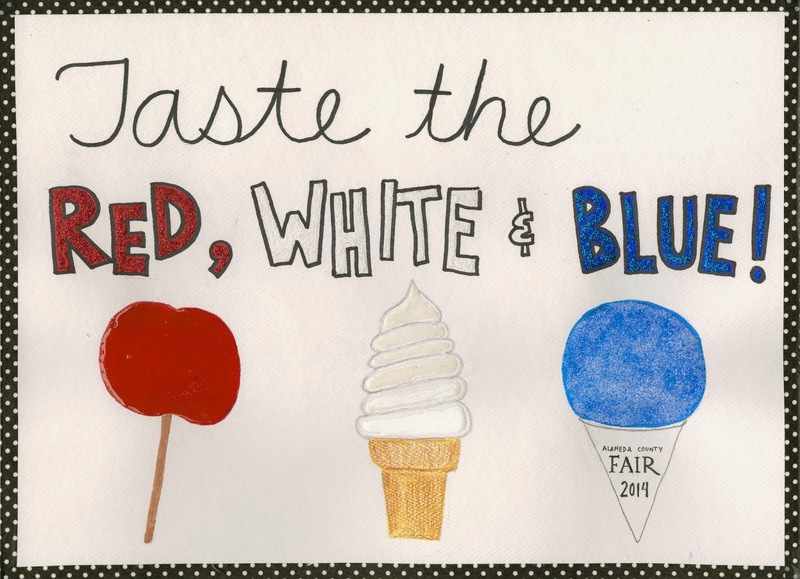 The requirements were simple: create a poster about the fair theme of "Taste the Red, White & Blue!" I was bummed that there wasn't an adult division, but signed Trevor up to enter. Even though I couldn't enter it, I decided to make one anyway. Trevor and I sat down at separate ends of the table and brainstormed our ideas. 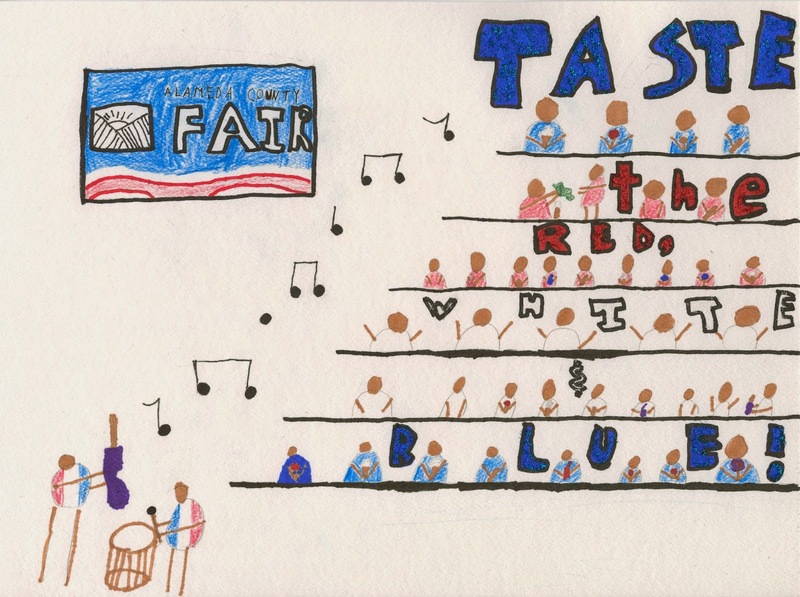 Trevor sketched out a band playing, with dozens of people sitting in the bleachers watching, each eating a red, white or blue food. He had music notes drifting up and the Alameda County Fair logo in the corner. Very cool! He colored it with Prismacolor markers, color pencils, and Sharpies, then added Stickles to make the words stand out. He really wanted to put black washi tape around the edges to mat it, but he hadn't left enough of a margin to do so. Other than that, he was really happy with how his poster turned out. I went a completely different route with my poster. I kept it extremely simple, with the theme across the top and fair foods across the bottom. After coloring everything with Prismacolor markers and adding Stickles to the words, I added a variety of media to each food to make it dimensional. I put Glossy Accents on top of the red candy apple, which added an awesome shine. I put Enamel Accents on the soft-serve vanilla cone. I added Distress Ice Stickles to the blue raspberry sno-cone, which looked exactly like ice crystals. Finally, I took Trevor's idea and added a black washi border. I love it in real life. The scan doesn't do it justice. Oh well! We'll be visiting the fair later this month so we can see how Trevor's poster did for his age bracket! Can't wait! I seriously love the fair. Loveeeeeeeeee both of your posters!!! can't wait to see the fair pics!!! !